Nineties country wouldn’t be the same without Tracy Byrd and his massive array of hits. 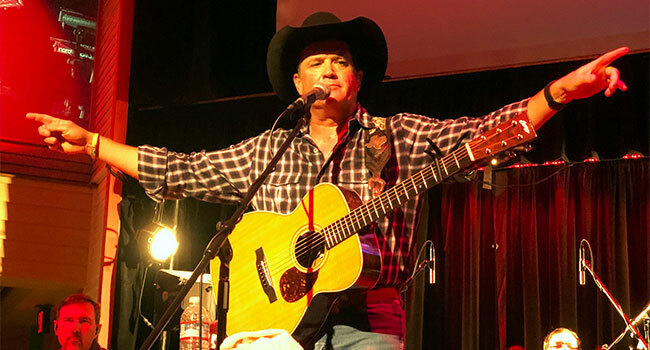 The Beaumont, TX native returned to Buck Owens’ Crystal Palace in Bakersfield on Saturday night (Feb 2nd) to kick off a tour celebrating 25 years as a recording artist. The sold out crowd loved that the Texas crooner was back and welcomed him and his band with “Ten Rounds” (pun intended) all night long! Opening with a fiddling rendition of our National Anthem, Byrd stood side stage smiling until midway when he graced the stage to loud applause. He kicked his two hour set off “Don’t Love Make A Diamond Shine” as he tore through hit after hit including “Lifestyles Of The Not So Rich And Famous,” “Ten Rounds With Jose Cuervo,” “I’m From The Country,” and more. The audience was on their feet all night singing along to every song. Byrd, who could be considered classic country in today’s market with a fiddle and steel guitar, was highly missed as he took several years off of touring outside of his home state. “Great times in Bakersfield and the first time this far west since going back on the road,” he stated. The tall Texan graced the stage with his guitar that included more hits like “I Wanna Feel That Way Again,” “Big Love” and “Holdin’ Heaven” which was his debut single and first No. 1 in 1993 on MCA Records. The singer even shared several cover songs he enjoys performing, including a pair from the Eagles: “Lyin’ Eyes” and “Desperado” — the latter in which he poked fun at himself as he forgot the lyrics all three times he had the band restart. The crowd absolutely loved it and sung it back to him which he was thankful for. Midway through, he bantered with the crowd for a bit, even taking requests like the album track “Why” and hit “Walkin’ To Jerusalem.” His main set consisted of twenty-five songs wrapping with “Drinkin’ Bone,” “Don’t Take Her (She’s All I Got)” and “Watermelon Crawl,” which had the entire room singing loudly as expected. Of course, it wouldn’t be a country concert in Bakersfield without a nod to the Bakersfield sound. His three song encore included included two Merle Haggard songs, “Farmer’s Daughter” and “Mama Tried” which were crowd pleasing. This was my first time seeing Byrd in concert and I look forward to seeing him again sometime. He is super friendly and personable. He shook nearly everyone’s hands he could before leaving the stage and was meeting everyone who wanted to hang around after the show. His six piece band is spot on and compliments him well. They interact with each other and Byrd gives them plenty of time to shine. Fans who attend one of his concerts are in for a night filled with fun, dancing, singing and drinking to all of your familiar favorites and then some. Be sure to check out Byrd when he comes to your area, and be on the lookout for fellow Beaumont native Mark Chesnutt tagging along for select dates billed as The Beaumont Boys.